Today's post is about BTrace which I am considering as a hidden gem for Java developer. 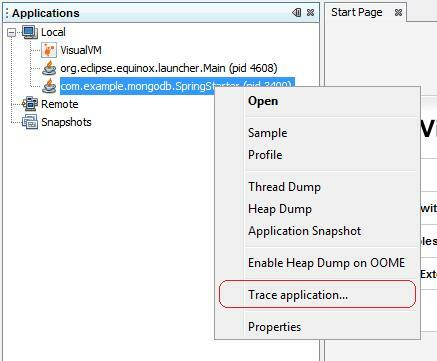 BTrace is a safe, dynamic tracing tool for the Java platform. BTrace can be used to dynamically trace a running Java program (similar to DTrace for OpenSolaris applications and OS). Shortly, the tool allows to inject tracing points without restarting or reconfiguring your Java application while it's running. Moreover, though there are several ways to do that, the one I would like to discuss today is using JVisualVM tool from standard JDK bundle. 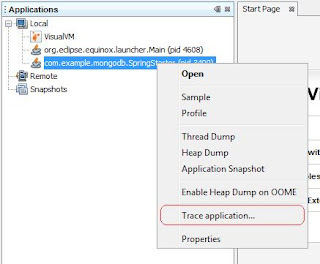 What is very cool, BTrace itself uses Java language to define injection trace points. The approach looks very familiar if you ever did aspect-oriented programming (AOP). So let's get started with a problem: we have an application which uses one of the NoSQL databases (f.e., let it be MongoDB) and suddenly starts to experience significant performance slowdown. Developers suspect that application runs too many queries or updates but cannot say it with confidence. Here BTrace can help. This is a place where tracing instrumentation could be defined and dynamically injected into the running application. BTrace has a very rich model in order to define what exactly should be traced: methods, constructors, method returns, errors, .... Also it supports aggregations out of the box so it quite easy to collect a bunch of metrics while application is running. For our problem, we would like to see which methods related to MongoDB are being executed. As you can see, output contains bunch of inner classes which could easily be eliminated by providing more precise method name templates (or maybe even tracing MongoDB driver instead). I have just started to discover BTrace but I definitely see a great value for me as a developer from using this awesome tool. Thanks to BTrace guys! Hey, I'm a community blog curator for DZone. I wanted to talk with you about potentially featuring your blog on DZone's content portals. Send me an email at allenc [at] dzone [dot] com and I'll explain the details. Thank you a lot, I will try to discover and share more interesting, useful topics and concepts.